I like the powder blue foliage of this variety, it goes so well with other blues, especially those with more textural qualities. As a smoother type it makes a good foil for Echeveria shaviana and Echeveria 'Curlylocks' both with their frilly edges. 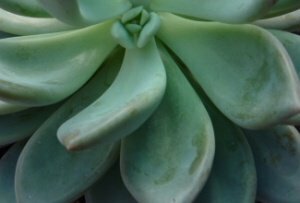 Echeveria 'Jackie' has plump, loosely arranged sword shaped leaves in silvery blue with lots of 'bloom' - the waxy protective coating common to many succulents. As you can see in this picture, it doesn't take much handling to damage it, even repotting is enough. Luckily, in time the plant will replace it. Sometimes a tall flower spray emerges which will stretch to about 30-45cm (12-16") displaying bell shaped flowers. The size of the rosette is ultimately over 20cm (8") across, and about 15cm (6") high. Best conditions are well drained soil with bright light. Propagates easily from leaf cuttings. Use as a specimen planted singly in a decorative pot to display in combination with other silver and blue varieties.